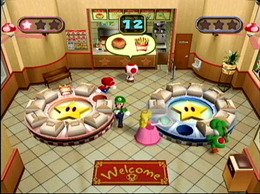 Order Up is a 2-vs-2 minigame from Mario Party 4. The phrase "order up" is sometimes used by diner employees to indicate that the meal they were preparing is complete and ready to be served to the customer. It returns in Mario Party: The Top 100. In a fast food restaurant, the red team is in front of a round table, and the food appears. The camera zooms out, and the game begins. At the beginning of each round, two each of five different food items (a hamburger, a corn dog, French fries, a drink, and an ice cream cone) are covered by boxes on a table, one for each team. 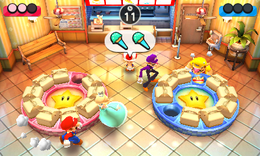 The tables then spin around for a while, and when they stop, Toad (the customer) orders two of the food items. The teams must remove the boxes to reveal the correct two food items - the team that does so first earns a point. Choosing an incorrect item causes it to be removed from the table. The team that earns three points first wins the game. In Mario Party 4, the camera zooms to the winning team as they run to the front of their table, and they do their winning poses. Rules – "Toad will order items that you must find in the boxes before the other team. First to 3 pts. wins." Advice – "Before the boxes come down, try to memorize the order of items in the circle." Description – "Find the boxed-up dishes to fill Toad's order!" On-screen – "Remember where each dish is and get the order ready!" French Burger del Amor "Love burger", in Spanish. It also has the same pronunciation as "Burger de la mort", which means "Burger Of Death". German Bestellung, bitte! Order, please! A poster with the name "Kinopio Burger" and a picture of Toad ("Kinopio" being his Japanese name) can be seen on the right wall, as well as a framed picture of a mushroom with a "K" inside of it, even in the Western releases of Mario Party 4. This page was last edited on February 11, 2019, at 01:28.